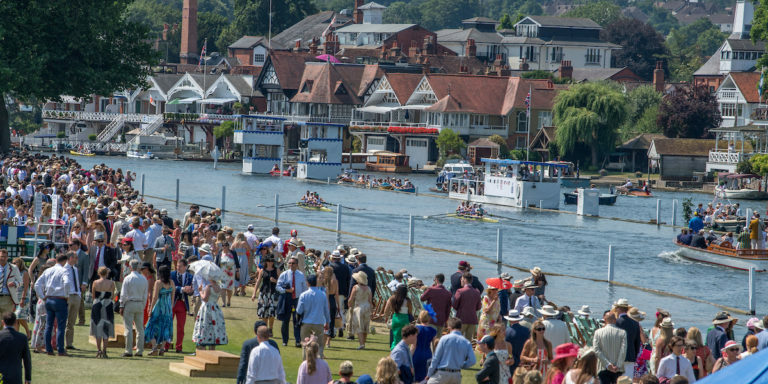 Don’t ever expect Henley Royal Regatta to be mundane. The 2018 Regatta may have been lacking in controversy, new technology or unknown clubs surprising the blazerati by winning age-old trophies. But as racing closed in the golden sunshine of Sunday July 8 the 179-year-old event delivered two stunningly memorable performances which those present will boast of watching for the rest of their lives, as Mahe Drysdale sculled one of the classic Henley races to claim his record-equalling sixth Diamonds title and the first eight of St Paul’s School in London rowed their way permanently into the history books. Drysdale’s victory was epic, and will be discussed later, but it was the jaw-dropping performance of St Paul’s, who smashed all previous fast school times to smithereens, which capped it. A real ‘were you there’ moment. Eight school rowers — by no means the heaviest or tallest — and a cox had, together with their coach Bobby Thatcher crafted a year of superlative technique and speed which took them unbeaten through every single head race and school regatta they entered to the doorstep of Henley Royal. Thatcher learned his trade while a GB oarsman in the famous Martin McElroy/Harry Mahon late-1990s eights project, of which perhaps more in Row360 one day. For those too young to know, Harry Mahon, who died untimely in 2001 from cancer at the age of 59, was the master of technique and flow, the smoothly efficient application of power. With every stroke they took, St Paul’s demonstrated that the Mahon technique, updated and combined by Thatcher and assistants with organisation, motivation, determination and level-headed resilience, produces extraordinarily quick crews. 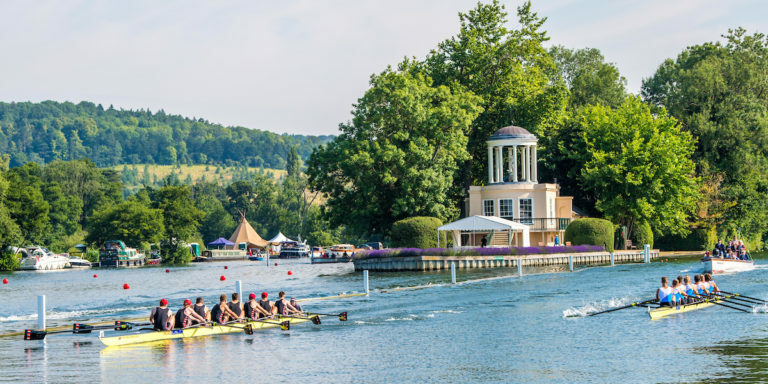 They came to Henley backed by a list of wide-margin victories, a time within half a second of the World Rowing best at Marlow Regatta, rumours of having come close to the Grand Fawley record during training, and nobody expected them to fail. So it was with the air of a coronation that St Paul’s took to the water on Sunday. Eton, as had Abingdon, Latymer Upper and Radley before them, told themselves they could win. But in reality it would have taken a miracle for St Paul’s to be beaten. The question was, how fast could they go? Held in check by Thatcher while they professionally despatched earlier opponents during the week, allowed only to match the Barrier and break the Fawley records, would they be let off the leash in the final? Ohhh yes…. Rowing with all the silken relaxation of their usual rhythm, St Paul’s eased out clear of Eton before the Barrier, and took a second off its time. Having chopped two seconds off the Fawley mark four days earlier, they then sliced off another two, bringing the Princess Elizabeth level with the Thames Cup, and becoming the first ever school crew to go under three minutes to Fawley. That was where in previous races they had throttled back, ensuring demurely small margins over their rivals. This time they stayed in top gear, sliding like greased lightning along the water, with bets as to their time being laid in the press box. Eleven seconds they took off the course record, dropping it to 6-06 — also par with the Thames Cup — and ensuring that theirs will be the only school listed under the PE on the “fastest recorded times” page in next year’s programme. Unless another crew — perhaps also from St Paul’s — can find similar magic speed, those numbers will stand for years. Photo Bobbi Thatcher greets his St. Pauls crew after their record breaking row. Britain doesn’t try to select single-club crews for the junior worlds, but there is an argument that this eight, the stern five of which are eligible along with the cox, should form the core of a crew. Thatcher didn’t disagree. 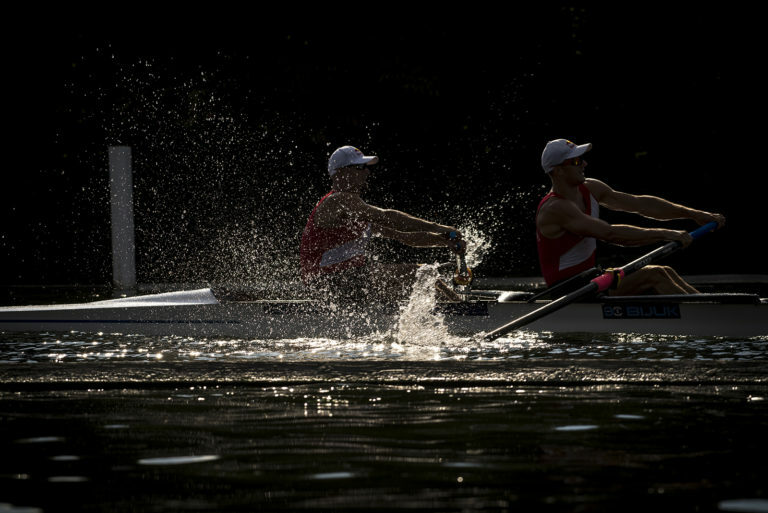 “In my opinion that eight would win the junior worlds. 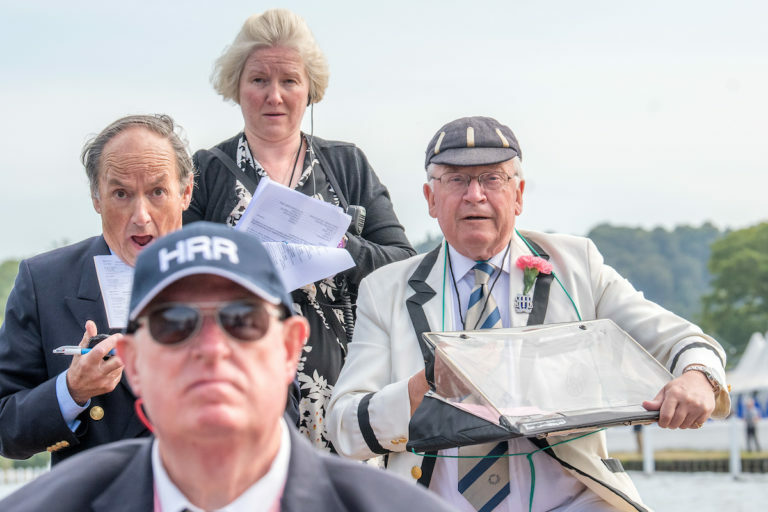 If you want to mess around with it that’s up to the selectors but I think they should leave it alone.” He coached his boys not only to go fast, but to move the boat beautifully, and on Henley Sunday Harry Mahon was looking down from the Great Enclosure in the Sky saying ‘yes’ to every stroke of a crew which kept his vision alive. 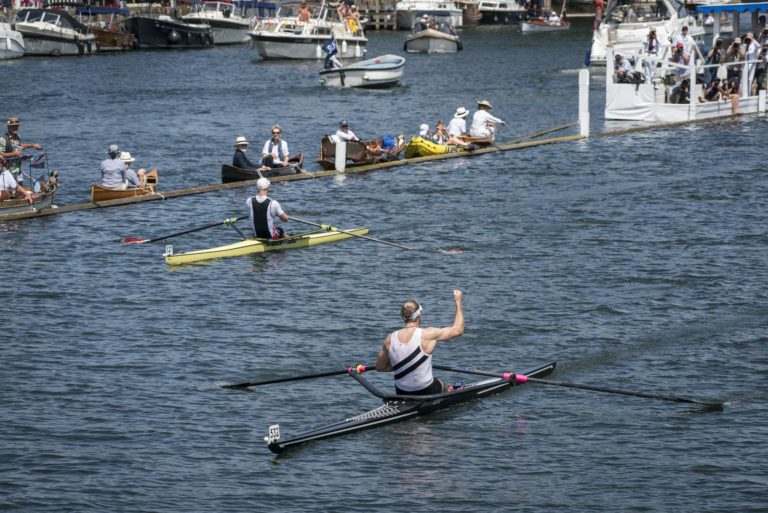 At the other end of the boat sizes a certain New Zealand sculler came into the competition wrapped in question-marks, but finished it with a victory which may just be a turning point for a champion bent on revival. Granted, Mahe Drysdale was ill in Linz, where he looked to be about ten seconds behind his Kiwi singles rival Robbie Manson, but since he had not yet beaten Manson domestically, time was rapidly running out to prove the old guard could pinch the 2018 worlds spot off the young gun. At Henley after dealing with two lesser opponents, he faced in the final world-class Norwegian Kjetil Borch, who had been seven seconds behind Manson in Linz. At stake was Drysdale’s reputation as a Diamonds expert, and potentially his international future. Borch lived up to the challenge with a cracking start which saw him whizzing clear of Drysdale before the end of the island. With the older rower looking fit but rusty, and a little stretched in the situation, the writing seemed on the watery wall. Drysdale may still be improving, but this sixth Diamonds title was surely not to be. As the Royal course unwound, the Kiwi’s chances to upset the Norwegian were running out, spurring him on to throw in last-ditch pushes. From Remenham to the Enclosures he sneaked back a few metres despite Borch upping the rating, but too little and too late. At least, it would have been for most races. Undeterred, Drysdale kept on pushing and in the mid-Enclosures some of Borch’s strokes slightly faltered. The Kiwi began to make real inroads, closing with every stroke, and suddenly it became an Olympic champion’s sprint against the exhausted flailing of a 2000m sculler who had run out of gears and used up all his energy. Drysdale flew past Borch and cruised away with strokes to spare. That 112 extra metres had made all the difference. Let’s be honest – it probably won’t be enough to take Drysdale to Plovdiv. Manson is much faster than Borch, and the Diamonds win was that of an expert in match racing at a highly unusual regatta. With world cup 3 in Lucerne confirming that Manson can outrow Drysdale with ease, I doubt the Olympic champion will be booking flights to Bulgaria. But the Henley outcome will give him confidence that he’s still getting quicker, and that he can use his wily experience to win hard races. From Drysdale’s recent interviews, he’ll be back next year to try for NZ M1x selection again whatever happens this summer. And probably for a seventh Diamonds too…. Snapping at the heels of Drysdale and St Paul’s for best performance was the winner of the Princess Royal singles, Jeannine Gmelin. The Swiss sculler cemented her reputation as the indisputable champion in this era not by beating Aussie Madeleine Edmunds, which she did comfortably, but by slashing the course record, missing becoming the first woman sculler to go sub-8 minutes on the 2112m course by only two seconds. The previous record-holders, sculling queens Maria Brandin and and Mirka Knapkova, would have been proud of Gmelin, who is fast establishing herself as this Olympiad’s dominant talent. This event, which is so often marked by great variation in scullers’ speeds and repeated ‘easily’ strolling verdicts, has now been dragged into the post-Rio era good and proper, by an expert who thoroughly deserved the trophy. Edmunds was an exceptional loss in an Australian national team which set out to raid the Henley coffers and largely succeeded. 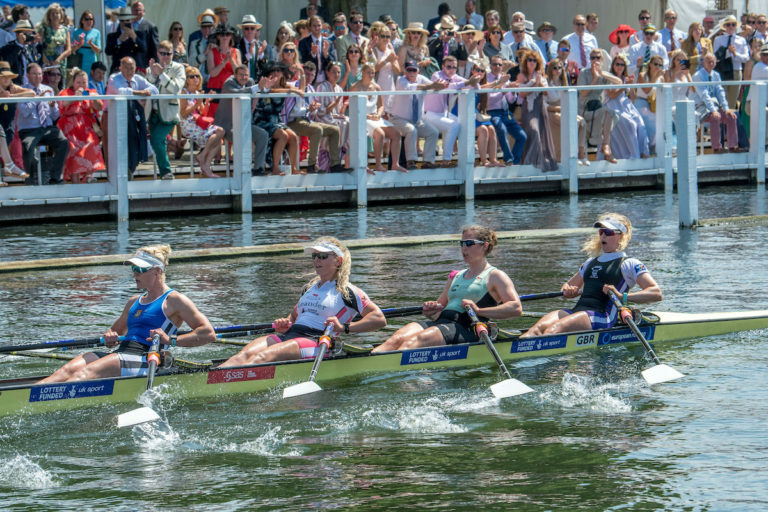 A cool-headed tactical approach to the Royal Regatta led the tourists to put their two top fours into their eights, yielding the Grand Challenge Cup and Remenham Challenge Cup with irritating (to their opponents) ease. The men, having disposed neatly of what is supposedly Britain’s best men’s sweep crew this year in the semi-final, had to scamper like rabbits to get back on Romania’s fast start in the final. Spectators were treated to the unusual spectacle of the losers Romania setting a new record to Fawley while in what looked like a very strong position, before the Australians started carving inexorable pieces off them. The Aussie charge put them level just inside Stewards and completely destroyed the Romanians’ confidence, allowing Australia to nip a second off the Grand record and record a margin pretty close to a length. Meanwhile the Aussie women had also played the temporary four-into-eight trick, and took on the British squad crew who had just reshuffled their top four in, but with a more permanent aim of the Europeans and worlds speed. Unfortunately the antipodean scratch crew came together better than the Brits, who found themselves floundering nearly a length behind as the Aussies equalled the Barrier mark. A push-back began at Remenham, but instead of working, merely inspired Australia to go inside the course record. There was a loss for Australians Cameron Watts and Angus Widdicombe, who found themselves up against proud pairs rowers Valent and Martin Sinkovic in the Goblets final. Watts and Widdicombe did the obvious and threw the kitchen sink at the start, but it only took until Fawley for the Sinkovics to catch up with them, and then the inevitable row-through occurred. What made the race special was that Valent and Martin crossed the line in 6-54, taking full advantage of the superb conditions to steal four seconds off the course record, which had since 1995 been owned by Messrs Redgrave and Pinsent. That takes Redgrave’s last record out of the books, as the rest were broken some time ago. Ah, records. It was a stonking year for them, with 25 equalled and another 36 broken. Of those 14 were course records, 11 of which went to new champions on Sunday after the wind blew up in late morning. The oldest full-course mark to be broken was the Britannia, which had stood since long before the coxed fours split into club and academic. Thames, facing the Molesey crew they had shoved out of the medals by 0.8 seconds at Marlow, had to set off with great intent and did so, matching the Barrier and Fawley while fighting to hold the men in black at bay. 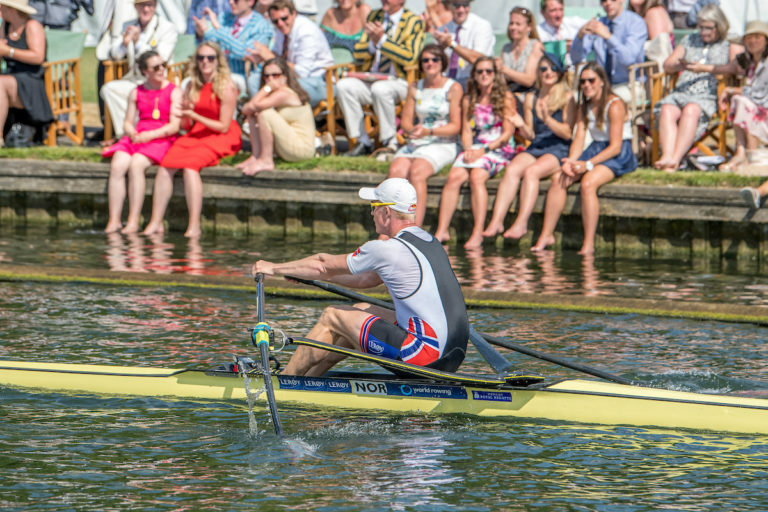 A Remenham Roar spurred on both crews, and Molesey briefly levelled the race at the Milepost. Undaunted, Thames counter-attacked and seized back control, going on to win by half a length, a generous margin for so tight a race. Without such motivation Thames would probably not have broken Harvard’s 1993 record by a second, so they have Molesey to thank for that. 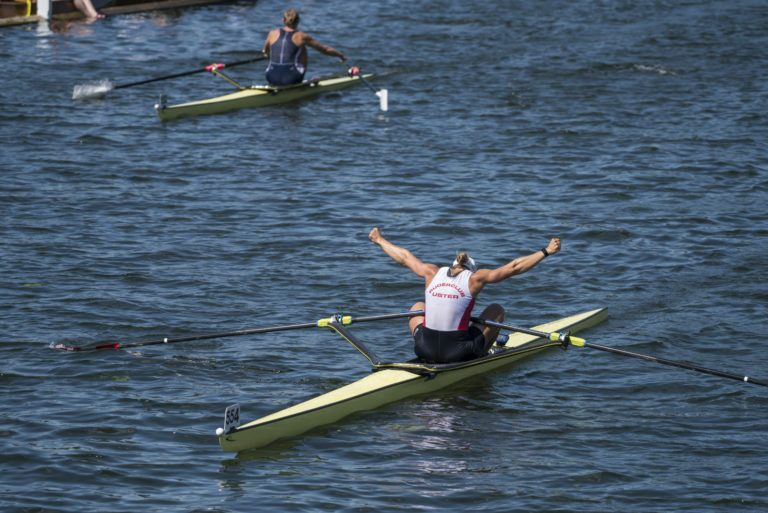 Photo A third Thames RC win in the Thames Cup on the Thames river inside four years. Thames’ autumn 2018 recruitment drive had already been put firmly into credit by their ‘Thames cubed’ win in the club eights: a third Thames RC win in the Thames Cup on the Thames river inside four years. Clearing Oslo soon after Temple Island, they were able to stalk along at a relatively relaxed pace, smacking the Norwegian club back down again whenever they tried to claim back some distance. Meanwhile Molesey had their own win to celebrate, having dealt with Australian club Mercantile expertly in the Wyfold coxless fours, on the way proving how mean it had been for the Stewards to select only overseas crews and ignore good UK crews including Molesey’s Ratzeburg double medallists. In other club news, Leander retained the Visitors’ coxless fours, getting the better of UL early on in a contest which featured several GB under-23 representatives and potential squad hopefuls across the two crews. Leander claimed new records to every mark, an impressive achievement given that the margin was already clear water by the time they reached the Barrier. Only two other crews, plus St Paul’s, broke all three records in a single race in 2018. The first of those was the University of Washington, a crew based largely on their second varsity line-up, who put paid to Oxford Brookes’ hopes of winning a third consecutive Temple Challenge Cup. Brookes, basically their third eight, struggled heroically for the title, but once they had let the Huskies slip to three-quarters of a length they could never close it further and the battle gave Washington the motivation they needed to hack five full seconds off the Temple record. That makes them the first Temple crew to go under six minutes, but is no surprise now that the rules have been relaxed so that non-freshman US oarsmen are allowed to take part. To the dismay of British students it looks probable that the Temple trophy will spend several more years overseas unless Brookes or one of the other university high-performance centres can muster a response. Brookes themselves completed a three-year winning streak with victory and a new Fawley record for their top eight in the Ladies’ Plate over their own composite. 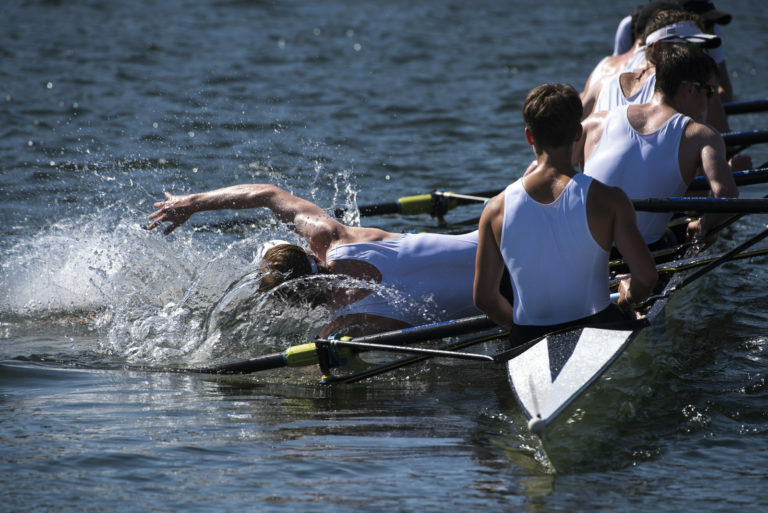 The other record-shattering eight-oared crew was Windsor Boys’ School in the Fawley junior quads, who came close to matching St Paul’s achievement, reducing their course record by seven whole seconds with the best wind of the day. It wasn’t much of a contest against Maidenhead, whose early-season success at the Schools’ Head, Scullery and National Schools was wiped out by the massive improvement their rivals had made in the previous month. Revenge was sweet for Windsor Boys, regular winners of the Fawley in its early days back when very few juniors sculled well, and now claiming their second consecutive title after a 19-year drought. 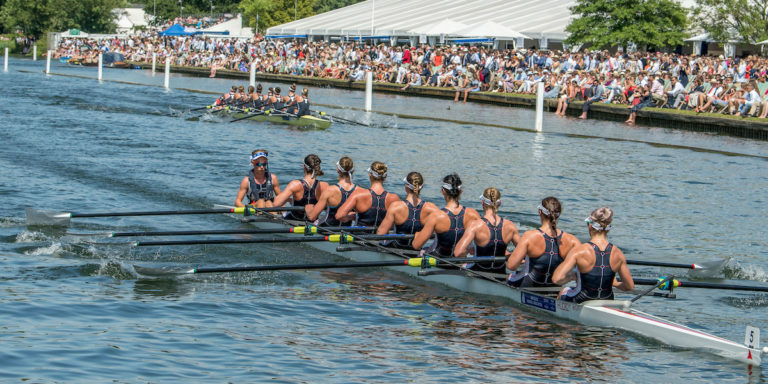 The new 2017 women’s events were endowed with trophies this year, after HRR chairman Sir Steve Redgrave was badgered unmercifully about the lack of them last summer. 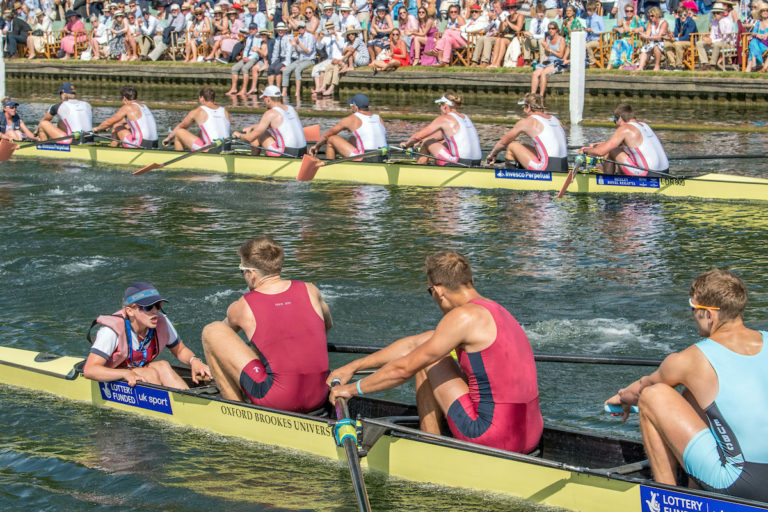 The Town Challenge Cup (coxless fours) went to the squad four after something of a procession over Molesey, while the Stonor Challenge Trophy (doubles) was also a straightforward race for the GB under-23 openweights over the under-23 lightweights. But the Hambleden pairs final was a cracker, under-23s Heidi Long and Hannah Scott managing to beat the probable GB senior pair of Rowan McKellar and Hattie Taylor after a tense and combative struggle right the way up the course. The senior duo had the upper hand early on, but the youngsters pushed through just after the Barrier and took clear water. At that point in many races Long and Scott might have thought the job was done but McKeller and Taylor were indefatigable and surged strongly back when their rivals had steering trouble, reducing the margin to half a length before Long and Scott recovered and pulled away powerfully. 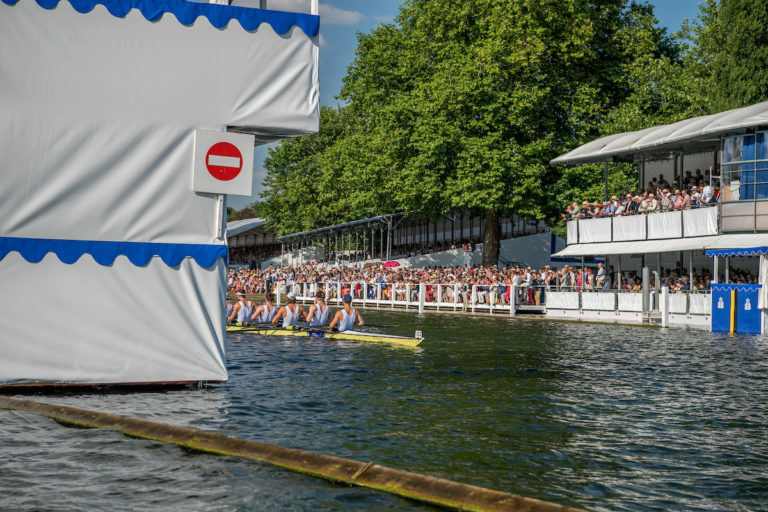 Two of the top events were sadly straight finals this year, the Stewards’ for the first time in a while and the Queen Mother quads for the second year running. The Stewards’ pitted a squad four, racing as Leander, against the quality under-23s racing as Oxford and Leander, but although the youngsters gave it a monster effort, the writing was on the wall for them. Level at the Barrier, the under-23s almost held parity long enough to join Leander in a new Barrier record, but were a canvas off and slowly dropped back off the more experienced crew. The Queen Mother Cup was almost a row-over when visitors Fana Rokklub — the Norwegian international quad — realised that Martin Helseth, was suffering from an injury which would keep him out of the crew. Apparently lacking any spare club-members in the UK (despite Linz M4x crew-member Erling Øyasaether having been dumped out of the doubles earlier in the week), they would have had to drop out but the Stewards invoked Rule Zero (actually rule 37**). That permitted talented Leander sculler Seb Devereux to join the Norwegian quad and give GB a race. The tourists zoomed off impressively fast but were no match for the British mid-race power which gave the quartet who were later to win in Lucerne records to both the Barrier and Fawley and only a second off the whole-course mark. Britain’s squaddies chalked up two other excellent wins, for the women’s quad in the Princess Grace over the Norwegian quartet, and a record-breaking victory for Angus Groom and Jack Beaumont over the famous lightweight Irish O’Donovan brothers in the double sculls. Neither tested the home squad crews much. Despite local supporters’ hopes, Marlow’s junior women were no contest for Y Quad Cities in the Diamond Jubilee, letting the girls’ quad trophy go overseas for the first time ever in its history. Y Quad are remarkable, not only breaking the course record twice during the week, but also younger than most: three of the crew are still just 16, with only stroke Caroline Sharis, their coach’s daughter, off to college next year. 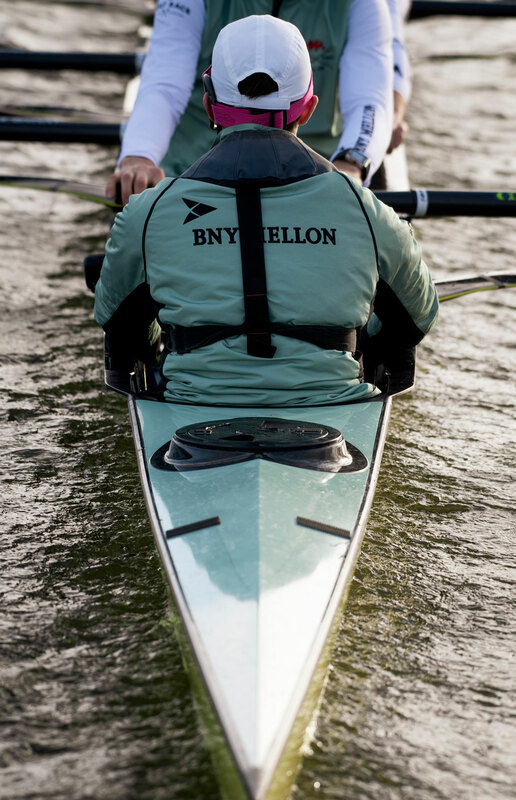 There were tight wins for Skøll in the Prince of Wales quads against the British under-23s, and for Imperial College over Goldie in the Prince Albert coxed fours. Oh, and on Sunday the “jackets off” announcement came half an hour before the first race even started. Now that’s a record…. **From Rule 37 of the Constitution of Henley Royal Regatta: “In exceptional circumstances the Committee shall have the power to abrogate, alter or suspend any rule provided it is satisfied that no crew is thereby placed in a less favourable position than it would have been in if such an exceptional circumstance had not occurred.” Or, to paraphrase, ‘the Stewards change the rules if they want to’.